If there is any particular computer that is meant for home use but brings something a lot more different than your regular PC, you may want to take into account the HP Sprout Pro: soon released and ready to deliver 3D printing and VR, this particular machine is unlike any other. Unless you count in the original HP Sprout of course. You’ll be able to tell that the HP Sprout Pro is a lot different from the very first time you see it because of its very unusual build and numerous stand out features. Things such as an extended arm that resembles a desk lamp and an inconspicuous mat that rests right in front of it are the main tools that the Sprout Pro uses to become something different. With no separate tower body, it having been incorporated into a single piece together with the display and everything else, the HP Sprout Pro resembles an iMac but is a lot thicker and differently shaped. The magic of the computer comes mostly from the extended arm and mat underneath it combo. Together they create a system that is capable or scanning and mapping 3D representations of any object placed on the mat. Even though the display that the computer is gifted with is touch-sensitive, so is the mat – and thanks to the projection cast from above, the latter can be used as a secondary, interactive display. There is a huge amount of uses that the HP Sprout Pro comes with, and that is only complimented by the powerful hardware it’s been granted as well as the intuitive software that augments the virtual reality elements of the computer. Any 3D scan can be imported into a number of post-editing and manipulation programs that will allow you to make use of 3D glasses and a special stylus. That way you can literally edit 3D objects in virtual reality, by hand, mimicking very well the exact same things that VR headsets are meant to achieve. Adding the fact that the software prepares said objects for actual 3D printing is only a plus. This is the type of device that HP developed in their trek of mixing actual virtual reality uses in design and education. 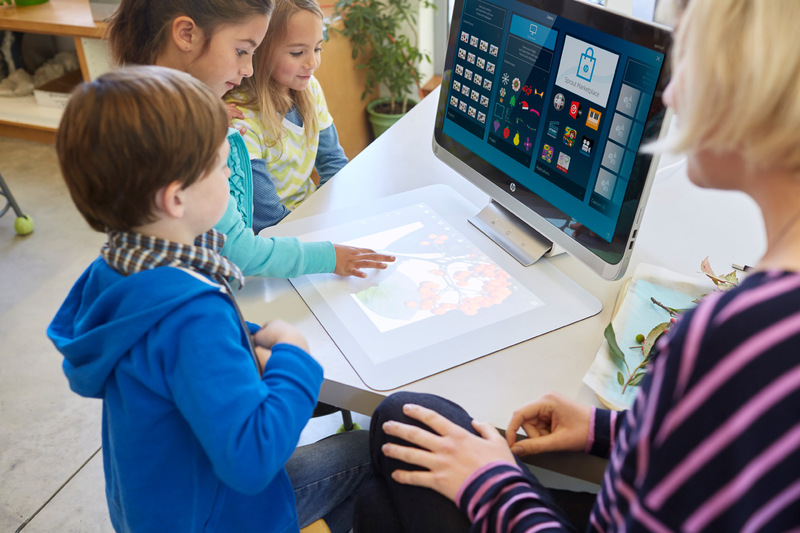 As a result, Hewlett Packard is planning to start intensive testing of the new Sprout in hundreds of schools by offering them free units in the hope that students will figure out even more uses for it. Even if its technical specifications suggest that the Sprout could very well be considered a relatively high end gaming desktop, given its 6th generation Intel Core i7 Skylake processor, an nVidia GeForce 945 GPU and at least 8 GB of RAM memory, it’s safe to assume that these are mere minimum specifications needed for virtual reality manipulation and use. While some schools will be lucky enough to make use of this desktop for free, anyone willing to purchase one of their own will be able to do so starting next month, but at the less than affordable price of $2,199.